I had dinner in the historic downtown section of Fernandina Beach. When I found out that my first choice for dinner was only open for lunch on Sunday, I explored and found Pepper's Mexican Grill & Cantina. I had the Enchiladas De Camaron. These were corn tortillas stuffed with grilled shrimp, then topped with creamy tequila sauce. Rice and black beans were served on the side. It was interesting and unusual to see an enchilada that didn't contain cheese at a Mexican restaurant. The shrimp were larger than average and the creamy sauce was very tasty. The rice and beans were both unfortunately a little bland tasting. This was my first visit to this restaurant since they renovated from regular Planet Hollywood to Planet Hollywood Observatory. When Downtown Disney rebranded themselves as Disney Springs, I guess a giant globe filled with movie props didn't fit into the story of a small town built around a spring water bottling plant that Disney came up with. Instead, the globe was painted grey and it is now an observatory to view stars. In doing so, they ripped out all of the movie props that made the old version of the restaurant interesting and replaced the majority of them with video screens projected on the walls. Guy Fieri was brought in to provide the restaurant's new menu, but celebrity chef fame doesn't do much when the menu ended up as boring as it was. Looking over the menu, very little spoke to me and everything was generic and overpriced. I ended up ordering the Championship Pulled Pork Sandwich. This had pulled pork, barbecue sauce, coleslaw, pickles, and onion straws. I know I was sort of dissing Planet Hollywood's menu, but this sandwich was okay. 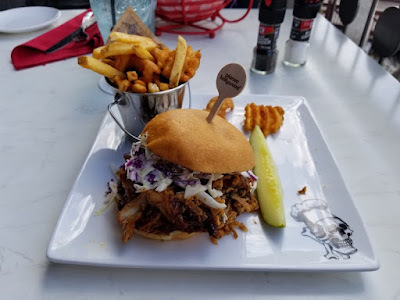 The pork was tender, and they kept it interesting by adding more than just meat and sauce on the sandwich. Fries and a pickle were served on the side.